A while back, Junie Moon showed off a clipboard that she purchased on Etsy by Jane's Apron. 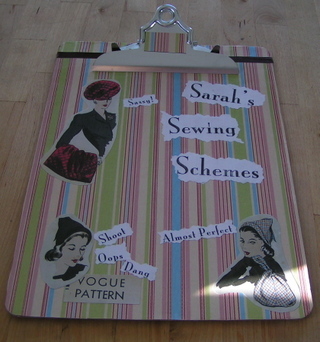 Low on cash to buy one of those great clipboards, I decided to make one myself that I could use to record my sewing projects. I'm not too experienced with paper art, except for origami. Decoupage is pretty new to me, too. But this was fun, pretty easy and it turned out well enough to satisfy me! I think the whole thing cost less than $10 to make. First of all, if I had it to do over again, I would have bought better clipboards. I bought mine from Office Depot. They were cheap enough but they had the store logo on the metal clip. I covered that using a magnet but it isn't perfect. Also, I might have painted the clipboard as Jane's Apron did instead of using the paper - this might have eliminated the problem of the paper being too short and me not thinking to match the stripes at the top. This is so easy, I didn't even bother to take pictures of the process. I used my computer and printer to create the printed text. The paper I used was a little more fibrous and stiffer than normal printer paper. I picked out a vintage pattern and color copied it. I cut out the pattern with straight scissors and used the ripped scissors to cut out the text. I outlines the clipboard onto the scrapbooking paper. I glued it on using the modge podge. I laid out my design on top before gluing and then glued it on. When dry, I gave another coat of the modge podge over the top. As the paper wasn't large enough to cover the board, I cut out smaller pieces at the top and used a coordinating satin ribbon in between them so the difference between the pattern wasn't too much. I used an adhesive backed thin magnet (the kind used for business cards) and cut it to size to cover the logo on the clip. I put a piece of scrapbooking paper on it and trimmed them together so they fit. Add your own pad of paper and cover your lovely design. That clipboard is fantastic. Thanks for the tutorial! I think you did a fabulous job with the clipboard. It looks very professional to me.